Raising the education leaving age in England to 18 is a key plank of the government's legislative plans, set out in the Queen's Speech. The leaving age bill includes a duty on parents to assist their children to participate in education or training. There are also moves to reform the apprenticeship system and to improve achievement for children in care. And, as expected, the government is to sell off the student loan book, currently said to be worth £18.1bn. This bill is designed "to ensure that young people stay in education or training until age 18 and to provide new rights to skills training for adults". "Raising participation will ensure that all young people - especially the most vulnerable - will benefit from the opportunities provided by continuing in learning." It means that in England by 2013, all pupils will have to stay in education or training until the end of the school year in which they turn 17. By 2015, this leaving age will be raised to the 18th birthday. The bill includes a duty on young people to comply with this regulation - and also a duty on their parents "to assist their children to participate". This raises the prospect that parents as well as children will face legal responsibilities to ensure attendance until the age of 18. But the Department for Children, Schools and Families says that this will not mean parents facing truancy-type fines. Instead, if they deliberately obstruct their children's attendance they could face parenting orders. Pupils who fail to comply are expected to face fines or community service, rather than prison. There will also be a duty placed on local authorities to ensure that young people participate up to the age of 18. Employers will also be required to release young people for the equivalent of one day a week of training. Providers of education and training will be legally obliged to notify the local authority if young people fail to attend courses. In adult education, "low-skilled adults" will have a statutory right to free tuition in basic literacy and numeracy. The Education and Skills Bill would extend similar powers to Wales - but the Welsh Assembly can opt out. And a spokesperson for the Welsh Assembly indicated that it would want to encourage more young people to stay in education, but without compulsion. The government claims that it has "successfully revived" the idea of apprenticeships after their "near extinction". This legislation is intended to regulate and promote their availability, as part of a drive to provide more workplace skills. There are currently 250,000 apprenticeships available, offered by 130,000 employers. 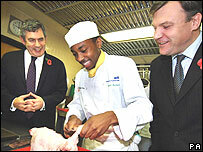 In step with plans to keep all young people in education or training until the age of 18, by 2013 all school leavers will be entitled to an apprenticeship place. By 2020, there is a target of 500,000 apprenticeships in the UK - 400,000 of which will be in England. The plans call for a statutory definition of what an apprenticeship means and a "right to public funding for apprenticeship programmes". It also proposes a duty on public bodies to offer apprenticeships. This proposes that the government should sell its student loans portfolio to the private sector. Currently worth £18.1bn, it is expected to be worth £55bn in the next decade. The government says the sale would be expected to raise £6bn by 2010-11. It promises that students would not have any changes to their terms and conditions and that details of interest rates and repayments would still be set by the government. Such a sale is "part of an ongoing government strategy to transfer ownership of all public assets that are not essential to the government's public service delivery objectives". This is intended to give a better start in life for children in local authority care in England and Wales. There are about 60,000 children in care in England at any one time - and 85,000 pass through the care system each year. They have suffered from very low exam results - about a third leave school without any qualifications at all. Only 12% gained the benchmark five good GCSEs last year, compared with 59% of their peers. The bill aims to bridge the "significant gap" between the quality of life and achievement of those in care and those not in care. It proposes that pilot authorities should be able to "test a different model of organising social care by commissioning services". It says that schools should ensure that children in care should not move schools when they are in their GCSE years of 15 and 16 years old. There should be a statutory requirement for a designated teacher for children in care, proposes the bill. It also says that young people should not be "forced out of care before they are ready".